Riding Solo to the Top of the World and One Crazy Ride. 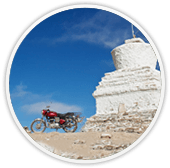 6 to 13-days tours to Ladakh covering breathtaking routes and destinations. 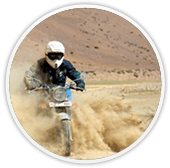 A Mecca for motorcyclists, Ladakh’s unsurpassed beauty demands that there be nothing between you and the landscape. A must-do tour for every true travel lover, Ladakh seduces everyone with her tough but rewarding landscapes and the highest roads in the world. All our tours to Ladakh cover the pristine Pangong Tso lake and Khardung La, the worlds highest motorable pass. 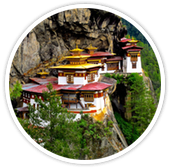 7 to 13-days tour to the Himalayan country of Bhutan. A country that’s pretty much blanketed by densely forested Himalayan mountains, Bhutan is a land firmly rooted in its traditions. The grand forts and monasteries leave one in awe and the happy locals paste a permanent smile on every traveler’s face. The twisty roads across varied Himalayan landscapes mean that the best way to experience this small Buddhist country is on two wheels. 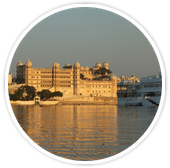 A 12-day tour to Royal Rajasthan. Rajasthan’s grand forts tell stories of a time when brave and noble kings ruled empires. But this desert state has a lot for a motorcyclist – we ride on the oldest mountain range in India, through the desert, indulge in some dirt-tracking and even a river crossing by boat. To top it off, we go looking for tigers and leopards in the jungles too! 9-day tours to Spiti valley in the Himalayas. 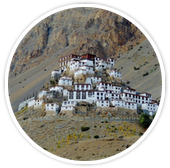 For those who really enjoy adventure and want to venture off the beaten track, our tour to Spiti valley in the Himalayas has it all. High-altitude passes, numerous water crossings, ancient monasteries and all in all, a stunning and varied landscape that will take your breath away. Been to Ladakh and thirsting for more? This is the tour for you. 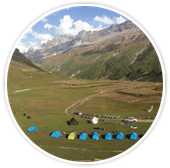 A 10-day tour to Pangi valley in Himachal. The perfect fix for an adventure motorcyclist looking for an extreme adventure on what is now dubbed “The World’s Most Dangerous Road” to ride on. Lots of off-roading, amazing countryside, camping and a total adrenaline rush. A 9-day tour to the Hidden Paradise. A lesser-known state in the Eastern Himalayas, Sikkim has high mountain roads, stunning landscapes and friendly locals. 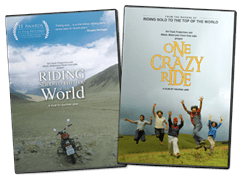 A motorcycle ride here offers both adventure and a rich cultural experience. A 10-day roller coaster tour through the “Hidden Land” of India. 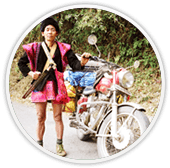 This 1,200 mile tour takes you through the most beautiful state in India, Arunachal Pradesh. Arguably one of the toughest motorcycle rides in India, you’ll bypass normal roads to find real adventure as you cover high Himalayan mountain roads, endless riverbeds, narrow jungle dirt-tracks and rickety bridges through a magical land that time forgot. 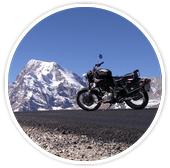 Custom-designed motorcycle tours tailored to your budget & preferred destinations. We get many requests from people who want private tours, unique motorcycling experiences, tours on dates that are different from our fixed-departure tours, tours to different destinations, or just tours at a different budget. Write to us and we will dig into our years of expertise to design an experience of a lifetime for you.